ISLAMABAD — Afghan President Ashraf Ghani alleged Friday Taliban insurgents fighting the government in Kabul are using Pakistan as a headquarters and demanded the neighboring country take immediate action against them. The charges underscore intensifying bilateral tensions in the wake of recent deadly attacks in the Afghan capital that killed nearly 140 people, including four Americans. 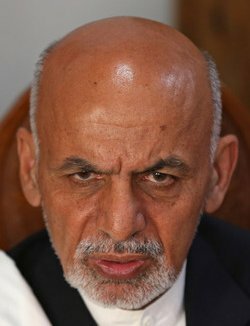 In a nationally televised speech, Ghani claimed eleven suspects arrested in connection with the violence have revealed the identities of the perpetrators and their locations. On Wednesday, the interior minister and the spy chief of Afghanistan made a surprise visit to Pakistan where they shared the list in a meeting with top civilian, intelligence and military officials. “Pakistan is the headquarters of the Taliban. The time has come for them now to take action [against the insurgents],” asserted the Afghan leader. At a news conference in Islamabad Friday that coincided with Ghani’s speech, foreign ministry spokesman Mohammad Faisal rejected allegations the Taliban and their allies, the Haqqani network, have bases in Pakistan and called on the Afghan government to focus on security lapses that led to recent bombings in Afghanistan. “We reject any allegations of support to the Haqqani network or the Taliban and of allowing them to use our soil. Pakistan has been taking actions against all terrorist groups in its territory,” he said. Faisal reiterated Pakistan’s resolve against terrorism. He said that Afghans have shared “some information” with the Pakistani government about recent attacks in Kabul and relevant authorities will look into it before Kabul is given a formal response. “All international reports, including those from the United States, have indicate that vast swaths of territory in Afghanistan is being used be a number of terrorist groups like Daesh,” Faisal noted, using an alternate acronym for Islamic State. The Pakistani spokesman was referring to latest U.S. military assessments the Taliban-led militants control or contest 44 percent Afghan territory. “Blaming Pakistan for security lapses inside Afghanistan is unfair, especially when such large spaces and support to these elements is available within the country,” he added. Pakistani leaders maintain that around three million Afghan refugees in the country, half of them undocumented, serve as hideouts for insurgents and have consistently called for repatriation of the displaced families for addressing the security challenge. The counter allegations have deteriorated an already strained and mistrust-marred relationship between Kabul and Islamabad. Ghani’s hard-hitting speech Friday came as a high-level Pakistani delegation comprising senior civilian and security officials, is set to travel to Afghanistan on Saturday to discuss mutual security, economic and trade cooperation. The United States is also pressuring Pakistan to do away with alleged militant sanctuaries on its side of the border. But at a Thursday Pentagon press briefing, Joint Staff Director Marine Corps Lt. Gen. Kenneth McKenzie dismissed suggestion U.S. military intends to undertake operations inside Pakistan. “Through a variety of measures we look to getting Pakistan cooperation and assistance as we pursue operations in Afghanistan. But no, we are not planning to conduct military operations inside Pakistan,” said McKenzie. Islamabad has warned against any unilateral U.S. military action, saying it would be determinate to bilateral cooperation against regional terrorism. A string of attacks rocked Kabul last month, beginning with a Taliban raid on the city’s heavily guarded Intercontinental Hotel on January 20, killing 22 people. Four Americans were also among the dead. Last Saturday, an insurgent suicide bomber detonated an ambulance packed with explosives near a highly-secured government building in Kabul, killing 105 people and wounding nearly 250 others. On Sunday, Islamic State suicide bombers assaulted an Afghan military academy in the capital, killing 11 soldiers and wounding 16 others. Afghan authorities instantly blamed Pakistan for being behind the attacks. Islamabad swiftly denied the accusations and condemned what it called dastardly terrorist attacks in the Afghan capital.